Over a quarter century, the renowned British international correspondent Lindsey Hilsum has covered crisis and conflict around the world. In February 2011, at the first stirrings of revolt, she went to Libya, and began to chronicle the personal stories of people living through a time of unprecedented danger and opportunity. She reported the progress of the revolution on the ground, from the conflict of the early months, through the toppling of Gaddafi's regime and his savage death in the desert. 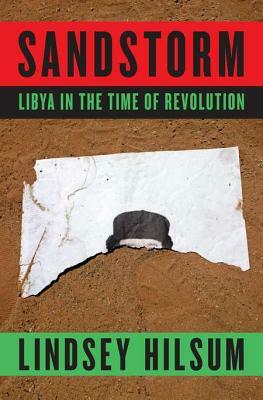 In "Sandstorm," she tells the full story of the events of the revolution within a rich context of Libya's history of colonialism, monarchy and dictatorship, and explores what the future of Libya holds. "Sandstorm" follows the stories of six individuals, taking us inside Gaddafi's Libya as events unfold, change accelerates, and those who had never before dared to speak, tell their stories for the first time. We see the dynamics of the insurrection both from inside the regime and through the eyes of the men and women who found themselves starting a revolution. Woven into her account is a revelatory expose of the dysfunctional Gaddafi family, the scale of whose excesses almost surpasses belief. She tells the stories of Libyans who lived in the United States or Europe, but went home to risk everything to provide secret intelligence, or commit daring acts of civil disobedience, to bring the regime down, knowing that the punishment if caught would be torture and death. The fall of Gaddafi, who was for forty-two years the great autocrat-madman on the world stage, is among the past decade's most dramatic pivot points. In Lindsey Hilsum, it has found its definitive chronicler. Lindsey Hilsum is the international editor for Britain s Channel 4 News and appears regularly on PBS s NewsHour, CNN and NBC. She has covered the major conflicts of the past two decades, including the wars in Iraq, Kosovo, and Afghanistan, as well as the Israeli-Palestinian conflict and the genocide in Rwanda. In 2011 she reported from Egypt and Bahrain, as well as Libya. Her journalism has won several prizes, including an Emmy, and recognition from One World Media and Amnesty International. Her writing has been featured in the "Sunday Times, the Guardian, the New Statesman," and "Granta," among other publications."